Time management is the process of planning how to segregate your time between specific activities to accomplish your goals effectively. Time is always limited, so ensure that you spend right amount of time on the right activity. Skills involved in managing your time efficiently include planning, setting clear-cut goals, prioritizing tasks, and monitoring where your time actually goes. Setting priorities is a vital tool in the time management toolbox. 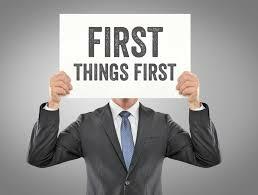 Put important things first i.e., complete the most difficult tasks first and then, identify your top priorities as well as the amount of time you need to invest in them. Good time management facilitates you to work smarter – not harder – so that you get more done in less time, even when pressures are high. Once, a lecturer walks into a classroom with a bag of sand, pebbles, some big rocks and a bucket. He calls out one of the student to put all three grades of stone into the bucket. The student duly comes forward to carry out the task, starting with the sand, then the pebbles, and then the rocks, which do not fit in the bucket. This is an analogy of poor time management. If the student would have put the rocks first, then pebbles and then the sand, all three would have perfectly fit as the sand slides between the pebbles and rocks easily. This is much like time management, by completing the biggest task first, you leave room to complete your medium tasks, then the small or easy ones. If you spend all your energy and time on the small stuff, you will never have room for the things that are significant to you. Therefore, take care of the big rocks first i.e., the things that really matter. Set priorities. The rest is just sand. Time flows in the same way for all human beings – be it rich or poor. It seems like there is never sufficient time in a day. But, since we all get the same 24 hours, why is it that some achieve so much more with their time than others. Time management helps you decide on what to prioritize in life. Rank daily tasks based on its importance and make a priority list. There is no one busy in this world, it just depends on priorities. One will always find time for the things that he/she feels important. It’s not about ‘having’ enough time. It’s all about making time. People with no definite goals will find it difficult to prioritize time. Set your goals as high as possible and strive hard to accomplish it. People often miss time unknowingly. For example, most people listen with the intent to reply, not with the intent to understand. You must probably seek first to be understood. The whole purpose of time management is to enable you to have enough time to spend with your loved ones, doing the things you enjoy. Pay attention to the stuffs that are critical to your happiness. In fact, if your mind is cool, you will start enjoying life. There are many principles of time management that would make a great difference to the way you manage each day. Mastering the principles of time management is important to achieving your goals. The key principle to effective time management is planning. Planning involves thinking in advance how to manage your time to achieve the desired goals or results. With an effective plan, you will never sit around and wonder as you will have a schedule with priorities that need to be achieved. This will enable you to finish one task completely and then move on to the next quickly. Self-imposed deadlines are one of the most effectual techniques of assuring productive effort by monitoring progress. Having unrealistic deadlines that are not going to work will definitely affect your effectiveness and causes stress. Therefore, get rid of the backlog and set goals for yourself. Multi-tasking is a myth. In reality, you are actually switching back and forth between tasks. While switching, you tend to lose the depth of your engagement, absorption thus makes you less efficient. Therefore, concentrate on doing and finishing one task at a time as far as possible. Distractions like phone calls, internet, emails, etc., may lead to compromise of performance and incompletion of tasks promptly. Therefore, make the necessary arrangements to keep these distractions to a minimum. Also, you should be an expert in avoiding distractions and maintaining focus on your task. Never forget to include time to relax in your schedule. Use your free time to do things you really enjoy! Spend time with your family, do exercise, go shopping or hang out with friends. And definitely you will start enjoying life!! This entry was posted in Personality development and tagged Creating deadlines, Deadlines, Do one thing at a time, Eliminate or Minimize Distractions, Give yourself a break, Minimize Distractions, Multi-tasking, Planning, Setting clear-cut goals, Time Management.